From time to time parents would write J. B. Rhine (the head of the Duke Parapsychology Laboratory) for help finding their missing children. 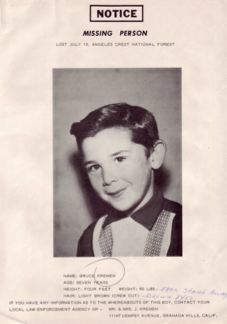 This is 6-year-old Bruce Kremen who went missing in Pasadena, California on July 13, 1960. Look at that sweet face. His parents tried everything, for years. At first Rhine would say, I don’t have much faith in them, but sure, try using a psychic. I know how Rhine felt about psychics, but I got the sense that he just didn’t have the heart to remove a source of hope. But then he stopped. He would tell parents outright that psychics cannot help you and they will only take your money and raise false hope. Actually, he didn’t say psychics in general, he would refer to specifics ones who made a living contacting parents like the Kremens. But I wonder about the Kremens family. What the rest of their lives were like. Did they have any more children? Did they break up (what frequently happens)? Bruce would be 52 today, so his parents would probably be in their 70’s. Oh my God. I just checked. The family is still listed in the phonebook at the exact same address where they lived in 1960. They are still there. Oh no. I just checked the Social Security Death Index, in case that was an old listing, and the father died in 2004. He was 84. I’ll still try calling. Maybe the mother or someone else will be there. I think his mother would appreciate knowing someone still cares about her baby. Please let us know about the conversation! Since it was 46 yrs. ago last week that Bruce disappeared, he’s surely been in the thoughts of any family members still alive. Hard to imagine a parent not appreciating the support of recognition and remembrance. I would love to know more of the story in & of itself, but I’m also interested in it in the context of Rhine — did they contact psychics? If so, did it make the situation more bearable for them? Did (do) they view Rhine as supportive?